The start is inauspicious – upon landing at Nagpur airport, there is no transfer waiting for us. We criss-cross the surrounds of the arrival terminal, but the airport is petite, and there is nowhere they could be hiding. As return travellers to India, we are only half surprised, and shrug our shoulders in resignation. But on the phone, Manisha, from Jamtara Wilderness Camp, is suitably horrified on our behalf. Profusely apologetic, she immediately leaps into action (despite the early hour) and rustles up a brand new transfer, phoning back repeatedly over the next half hour to advise us of its imminent arrival, and to check that we are in the vehicle and on our way. Our spirits (and expectations) rise. And, after a reassuringly uneventful and expertly navigated three hour journey, those expectations are most certainly met upon our arrival at Jamtara. Smiling staff wave enthusiastically as we approach along the dusty driveway, and while we indulge in a cool towel and an even cooler drink, our luggage is discretely whisked off to our abode. Rafiq, our host during our time at Jamtara, guides us to the open sided lounge tent for an introduction and orientation to life at the resort. 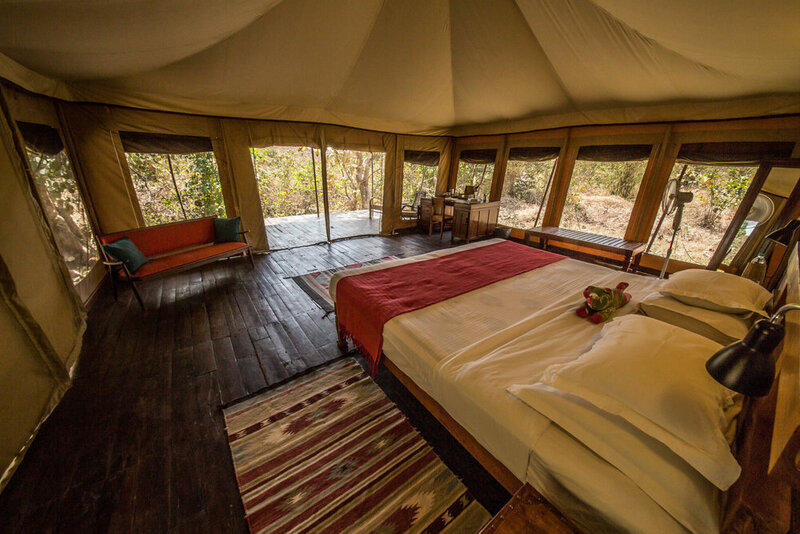 Jamtara Wilderness Camp is located on the northern aspect of Pench National Park, the only high end lodging on this side of the park, and with private (read, queue-less!) access to the nearby Jamtara Gate (this was one of our main incentives to stay here). The camp has just 10 luxury tents, adding to its exclusivity. The camp is full on the day of our arrival, with several rooms occupied by a BBC team making a documentary. Soon we are guided to our tent (number 8), our home for the next three days. 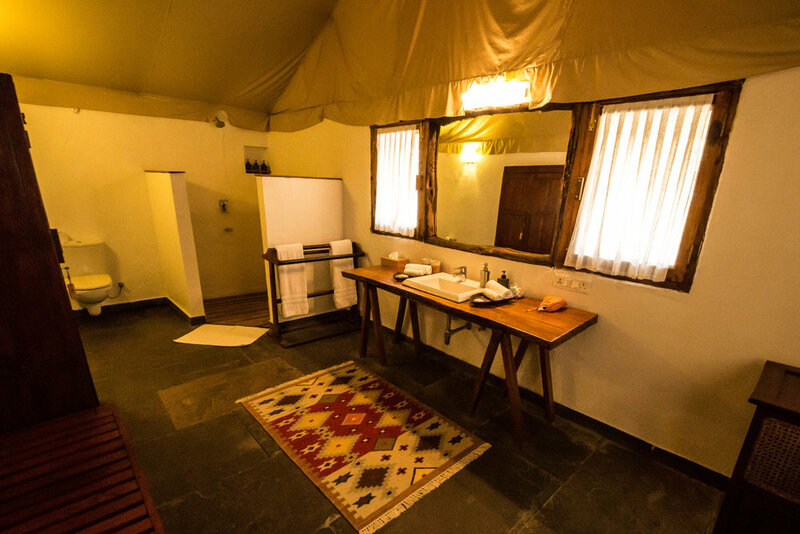 Nestled in a grove of arjuna trees, our tent is a well-designed blend of canvas and brick. The main area, an expansive bedroom and sitting area, is tented, with canvas walls and roof but elegant hardwood floors. The window flaps can be opened with ingenious indoor pullcords, allowing 180 degree views of the surrounding bushland, the nearby dry river bed, and the wildlife that wanders by (no big cats during our visit, but leopards have previously been seen in camp). The room is dominated by the impressive king bed and colonial furniture, recycled from a previous government house, while the stone wall behind the bed displays colourful artwork, as well as supporting the electrical fittings and a welcome airconditioner. 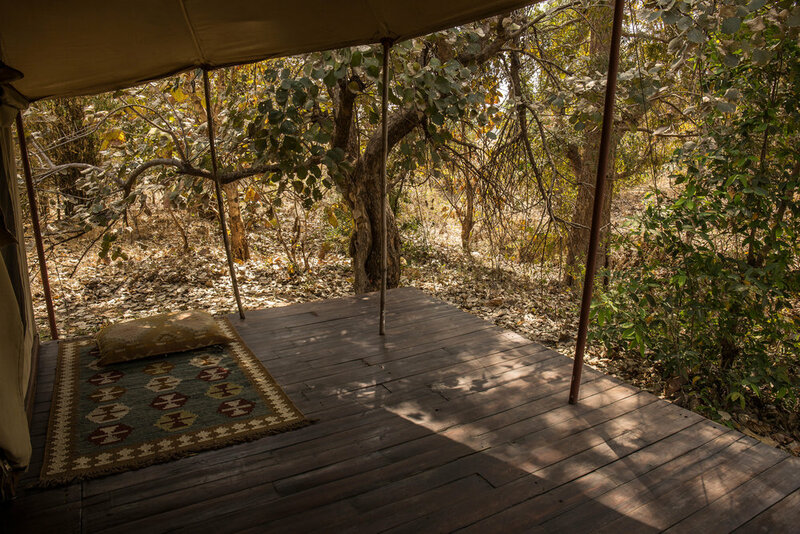 At the front of the tent, the hardwood floor extends onto a delightful decking, with armchairs for relaxing to the sounds of the surrounding jungle – the calls of birds, the humming of iridescent dragonflies, and the soft scrunching and crunching of lizards in the dry undergrowth. The other part of our lodging is the solid mud-brick bathroom, with white-washed walls and luxury fittings. The water for our shower is heated whenever we are likely to need it – the staff predict our requirements with unfailing accuracy during our stay, and the water is always piping hot. After freshening up (after our long journey from Australia), we return to the main lodge for lunch. The focal point of the camp, the main communal area is in a beautiful heritage building, with white stone walls, feature woodwork, recycled timber floors and large open windows. It is brightly decorated with art, photos and eclectic memorabilia, and furnished with antique leather couches and ottomans. Lunch is taken at a massive table made from a single tree trunk, and is a delightful introduction to the culinary situation at Jamtara – traditional, bountiful and delicious. In front of the lodge building, an infinity edge pool extends towards the forest. Surprisingly cold despite the 40 degree days, it is a welcome, if bracing, treat that we indulge in each day between our morning and afternoon safaris, accompanied by refreshing mocktails, such as the delectable green-grape caipiroska, or a well-mixed virgin mojito. Beyond the pool, a gnarled banyan tree spreads its canopy wide over a clearing. Here, lantern-lit and atmospheric, a bar and bonfire are set up each evening, for cocktails and canapes and sharing stories of the days sightings with fellow travellers. ... but you may share it with the locals! Dinner on our first night is in the main lodge, at the large dining table – a delightful three course affair, with the main consisting of multiple curries and accompaniments, each expertly served in individual portions by the wonderful staff who explain each meticulously prepared dish. The spiciness has obviously been toned down for western palates, but requests for spicy sauces and achaars (pickles) are met with delight (and once requested, usually appear specially for us in each subsequent meal). Like lunch, the food is traditional and flavoursome, much of it made from locally sourced produce, including vegetables grown in the nearby village, and the staff ensure we are very full before we retire. On our second night, Rafiq finds us as we are finishing up our pre-dinner drinks – there is an Indian flying squirrel hiding in the roof, if we would like to see it. They guide us behind the main lodge and up a narrow spiral staircase to the roof. Here, D cottons on a little faster than A – who is still looking for the flying squirrel in the rafters, while D realises there is a candle-lit table for two, surrounded by lanterns and impossibly romantic, nestled on the roof balcony. It is a lovely gesture, and we indulge in an Indian chardonnay to celebrate (which was surprisingly crisp!). On our third and final night, we are happily enjoying our canapes at the banyan tree campfire, but hear some murmurings from fellow guests – they are hungry, and the lodge hasn’t even begun to set up for dinner yet. We glance at the main building, and see that the dining room does appear to be disconcertingly bare. But once again Jamtara has conspired to surprise and delight its guests, and shortly we are being led through the forest and along the dry river bed to a small clearing, be-decked in glowing lanterns and candles, where long communal tables have been set up for our evening feast. Between these culinary indulgences, we do obviously partake in the main reason we are at Jamtara Wilderness Camp – adventures in Pench National Park. Our tickets to the national park have been expertly arranged in advance, and morning and afternoon safari drives are included in the daily rate. We have paid extra for a private vehicle, a wise move we would highly encourage – the safari vehicles (Suzuki Gypsies) are far smaller than African safari vehicles, and with the naturalist from Jamtara and the compulsory guide from the national park, there is not much space to spread out. Our naturalist, Dhiraj, is a highly trained expert of Indian wildlife, having spent many years as a researcher in the field before becoming involved in guiding tourists. He knows Pench and its wildlife comprehensively, and knows just the right amount of information for us – enough to keep us entertained and enlightened, but never enough to bore. Indeed, much of our safari time is spent in comfortable silence, with all passengers appreciating the splendour of the forest as we meander through it in our safari vehicle, ever alert to the alarm calls that suggest a tiger may be near (see our post regarding Pench National Park). 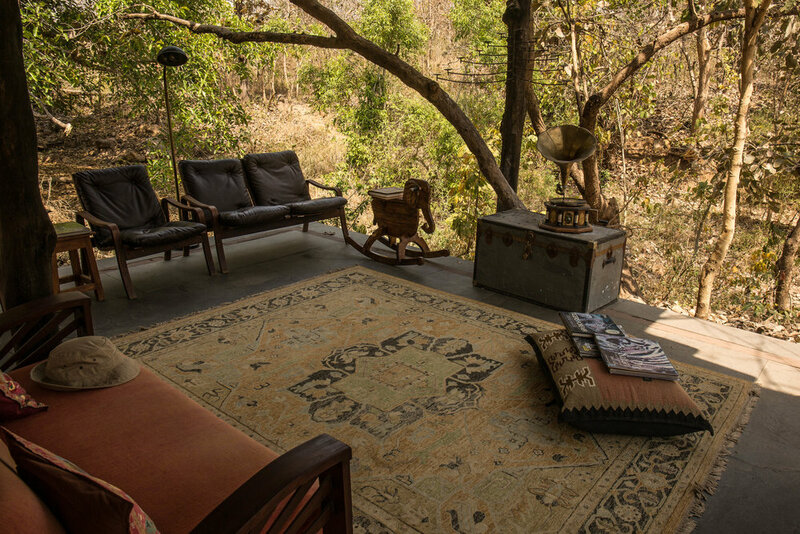 We spend three days at Jamtara Wilderness Camp, including six safaris in Pench National Park. It is a wonderful introduction to the Indian safari experience – safaris are well organised and efficient, with an expert naturalist at our disposal, whilst between safaris the lodge is luxurious but authentic, nestled in natural surroundings but with all modern amenities, and delightfully exclusive and away from other camps. The staff are charming and enthusiastic, and seem truly keen for guests to enjoy themselves. And the food is accomplished and delicious, and the ever-changing destinations for dinner a particular highlight. § 10 luxury tented rooms, spread through brushland adjacent to a dry river bed. § Each tent is part canvas, part whitewashed mud brick and contains a king bed, couch, writing desk, trunk, eclectic artwork and ornaments, an airconditioner (very effective) and a fan. There is a multi-outlet universal charging board, a kettle with tea and coffee, a jar of cookies (very more-ish, and fortunately replenished frequently), a safe, a hairdryer and ample bathroom amenities (soap, shower gel, shampoo, conditioner). § Also provided is a small book on the wildlife of Pench, self published by the Camp – a useful guide to the plethora of fauna inside the national park, and available to take home as a souvenir. § Water is heated “as required” but was always available when we needed it, and is piping hot. § Laundry is available, with same-day return, but is not included in the room rate. § There is no television or wi-fi in the rooms. § Wi-fi is available at the main lodge – but was intermittent. 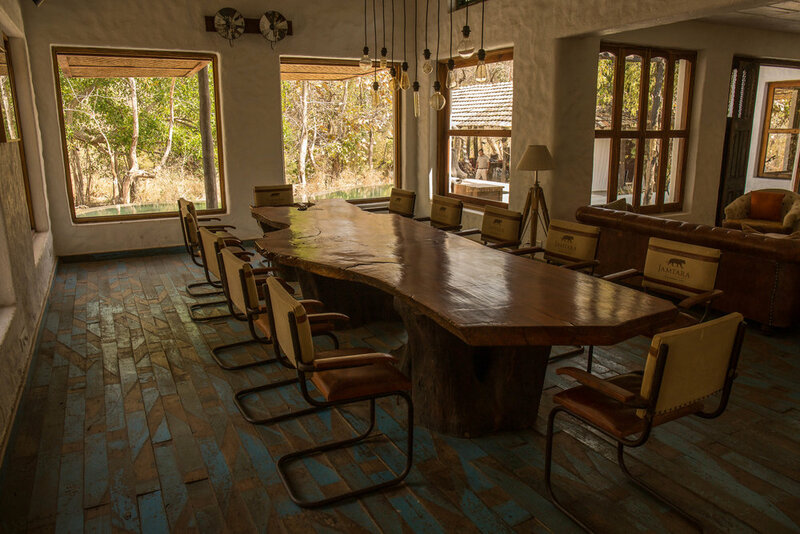 § There is limited telephone reception at the lodge, and within Pench National Park. § Safari vehicles are government regulated Suzuki Gypsies – small open-topped 1.3L 4WD vehicles. There is a drivers seat and passenger seat at the front, and then two tiers of bench seats behind – you can fit three-across on these bench seats, but this is cosy, and nobody wants a middle seat! The compulsory guide provided by the national park is allocated the left-hand-side seat in the back row (this is specifically labled!). § With the naturalist and the park guide, the vehicles can seat six tourists, for a total of eight passengers (not including any babies or small children on laps!). This sardine-can arrangement was a common sight within the park, but if you are serious about your comfort or your photography, plump for a private vehicle (approximately A$150 per safari, and worth every cent!). § Despite days reaching 40-42 degrees, the mornings and evenings are still cool. In particular, zipping along in an open gypsy at 5:30am is bracing, and despite warm jumpers, the blankets provided in the vehicles by Jamtara were still necessary and appreciated (although the hot water bottles at a subsequent lodge were even better!). Evenings were also cool, and a cardigan or wrap is recommended for dinner. § Jamtara provided beanbags for resting our camera gear on, upon request. § While at Jamtara, 4 of our 6 safaris were booked to enter through the Jamtara Gate, a three minute drive from the lodge, while the remaining 2 were from the Karmajhiri Gate, a twenty minute drive from the lodge. However, we always exited via the Karmajhiri Gate – this seemed to be done to maximise our time within the park (as the Jamtara Gate is further away than the Karmajhiri Gate), and while this was appreciated, the additional twenty minute drive home was a bit tiring after a long day of driving. § Costs (in 2018): Rs 43,500 per room per night, approx A$860 per night. This includes all meals, snacks and non-alcoholic drinks, two shared game drives per day, the services of a resident naturalist and all national park fees (including the compulsory national park guide). § Alcoholic drinks and laundry are not included. § A private safari vehicle is Rs 7,500 per safari (approximately A$150), and well worth it, both for the space and the flexibility. § Jamtara can also arrange transfers from Nagpur airport (the closest commercial airport) or Seoni (for private charter flights), and onwards to other national parks such as Tadoba, Kanha or Bandhavgarh, and provide drinks and a packed lunch for the journey. Our transfer from Nagpur was Rs 6,600 (A$130) and onwards to Kanha National Park was Rs 6,500 (A$128).